Have you ever noticed how some of the ugliest foods can be the tastiest? That’s definitely the case with this broccoli dip! 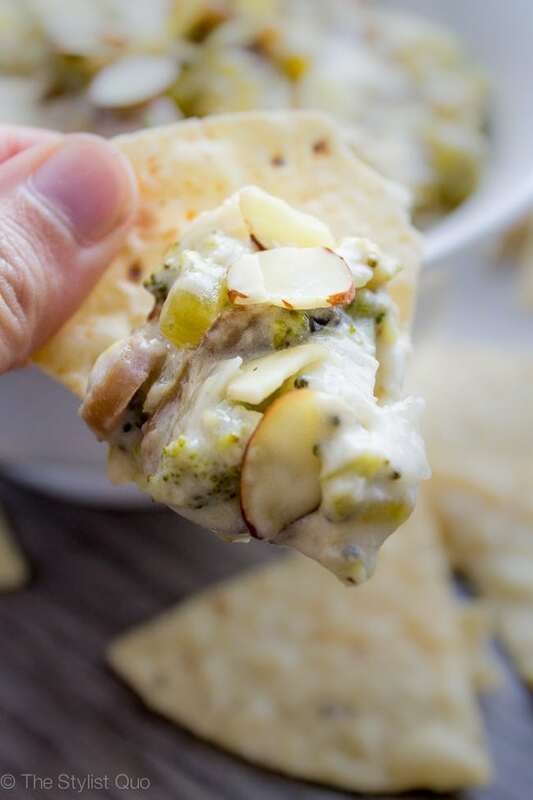 I’m guess it could be uglier, but this unbelievably delicious dip, packed with pepperjack cheese, broccoli, mushrooms, and sliced almonds was definitely hit by the ugly stick. We should be nice to it because of its misfortune.. and eat it. All the time. ALL THE TIME. This is one of those party foods my mom’s been making ever since I could eat solids, and it’s a hit at every single event. It might not be the fanciest thing ever, but you know how unfancy food sticks around? By being FREAKING DELICIOUS, that’s how. There’s so many caps in this post already.. I APOLOGIZE. Whenever she makes it for a family event, my sister, her boyfriend, O, and I hover over it like possessive addicts, growling at anyone who dare approach. It’s really pretty classy. Really. 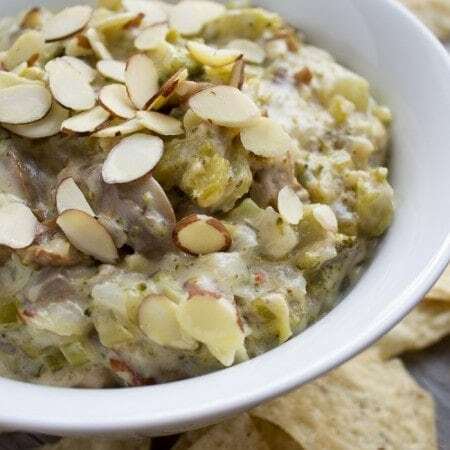 What I love most about this dip is that it performs swimmingly in a Crockpot.. but you’ll end up with all your friends huddled around it at any given party. It’s also got broccoli, so it’s clearly healthy. The broccoli, that superfood of superfoods, definitely offsets the evil cream of mushroom soup and hefty serving of pepperjack cheese. It’s science; look it up*. This dip comes together in about 20 minutes and you can make it the morning of serving and let those flavors meddle all day in the Crockpot, or, do like I did this time, and make it the night before and refrigerate the pull-out ceramic dish of the Crockpot overnight. 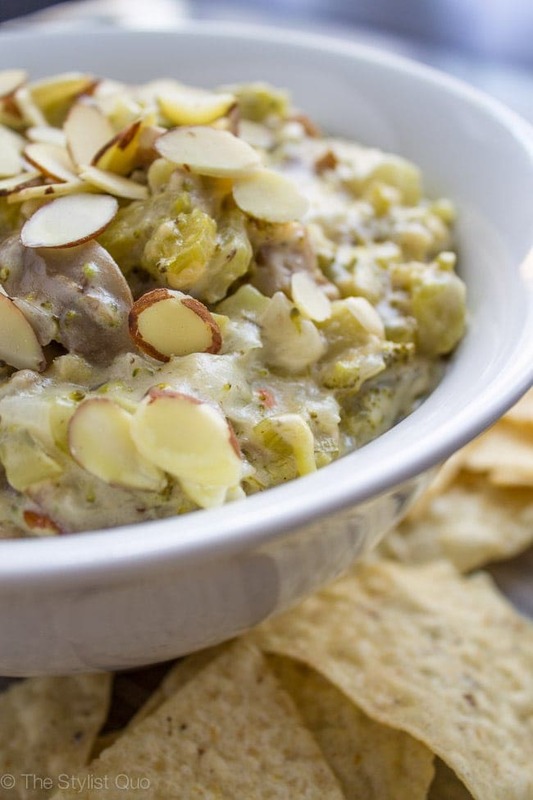 You’ll love this dip because it’s completely delicious. The slight spiciness of the pepperjack cheese provides a creaminess that blends beautifully with the chopped broccoli and tender mushrooms. The butter-sautéed onion and celery gives a nice base to the whole thing and offsets the use of canned mushrooms, frozen broccoli, and canned soup with a bit of classical technique. To top it all off, it’s pretty darn easy. It freezes beautifully, so make a double batch and freeze half. I always have a flattened ziploc gallon bag of the stuff in the freezer for last-minute entertaining. Make this! Call up some friends and share. My number is..
A delicious hot dip with broccoli, mushrooms, and sliced almonds. Perfect in the Crockpot and freezers beautifully. Serve with tortilla chips. Melt butter in a large skillet over medium heat. Add celery, onion, and mushrooms and cook until soft. Add cream of mushroom soup and heat until mixture starts to barely bubble. Add cheese, a couple slices at a time and stir until melted. Repeat until you've incorporated all the cheese. Add in cooked and drained broccoli and stir to combine. Serve in a small Crockpot or chafing dish. Serve with tortilla chips. *Please don’t look it up. That’s not science in any way. it sounds like a delicious dip! This dip looks completely and “disgustingly” amazing. I know everyone hates on canned soups, but sometimes you just need to use them. They really work in some recipes – like this one. We can’t always eat healthy 🙂 Do you think I could substitute more almonds and broccoli for the mushroom slices? I am a mushroom hater. I can handle to soup but definitely not the slices. I wish I could get myself to eat them. It would give my cooking life so many more options, but I just can’t do it. You’re so right! “Cream of” soups are definitely the ugly stepchildren of the culinary world, but this recipe has been around for something like 35 years.. it wasn’t the case back then! And you know what? They’re SO DELICIOUS sometimes. I tried a recipe my mom always made with cream of chicken soup with a can of organic stuff I got at Whole Foods, and it was just terrible. Anyway, you could definitely sub some more almonds or broccoli for the mushroom slices. You probably won’t even miss them! You could even sub in some artichoke hearts chopped up a bit, and I bet that would be super nom! I can’t believe you don’t like mushrooms – I’m forcing them on O 🙂 I used to hate them raw growing up, but now they’re definitely one of my favorite ingredients ever. They add such an awesome earthy flavor and so much umami! I might have learned to love them when I was vegetarian – it’d be super tough to be veg and hate mushrooms. They add so much meaty bulk. OK.. sonnet to mushrooms another day.. Okay maybe someday I’ll get around to liking them. You would have to like them to be a vegetarian, and did you go through a vegan phase too? That would be so hard without mushrooms. I keep telling myself that I should learn to like them, but I just can’t do it. Maybe I will have to put it on my New Year’s resolution list, and maybe I will work up to them in small doses. 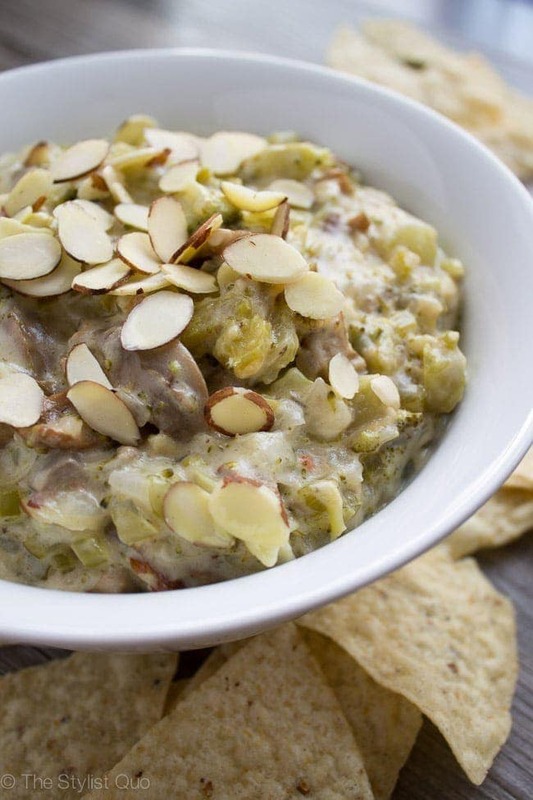 Like in this dip if I cut them up really small, but the artichoke idea sounds really great too. We’ll see when I get back to the world of normal cheese! Haha! That’s too funny. I feel the same about blue cheese and celery. They’re like the only foods I don’t like but I WANT to like them so bad! You don’t even like cooked mushrooms? What are their cheeses like there?! I LOVE learning about foreign groceries. Please tell me you’ll do a post all about the grocery store there if you do start a second blog! You don’t like celery? Hm. Not liking blue cheese I get, but celery is an interesting one. I guess I could see why people would like it though. It’s pretty boring by itself. When I was a kind my mom would fill celery sticks up with cream cheese instead of peanut butter and serve them with the appetizers for Thanksgiving. I loved it. I think that’s why I’m so obsessed with cream cheese. I literally eat it with a spoon, BUT the weirdest thing I do is dip Cool Ranch Doritos in it. I started doing it in high school with leftover cream cheese from my bagels, but by college I was sitting on the couch with a bag of the chips and block of cream cheese. My roommate though I was so weird… but then she tried it and liked it too. I would definitely do a post like that if I get this new blog started. I’m still on the fence, but I’m pitching the idea to Marc today! By the way, I love the new picture! Aw, thank you, that means so much! I started really working on it a couple months ago 🙂 And yes, ugly food can be a lot like stinky food.. it can be so freaking yummy! Like feta or fish sauce – ha! I think oftentimes ugly food is the best.. because like I said, if it weren’t SUPER delicious, we’d NEVER make it! Do you watch Master Chef? It reminds me of a chef/photographer they had on there last season who created gorgeous food but it never tasted quite as good as everyone else’s!